These Ginger Bread Cookies are a classic, one that represents the tradition of baking cookies at Christmas time. 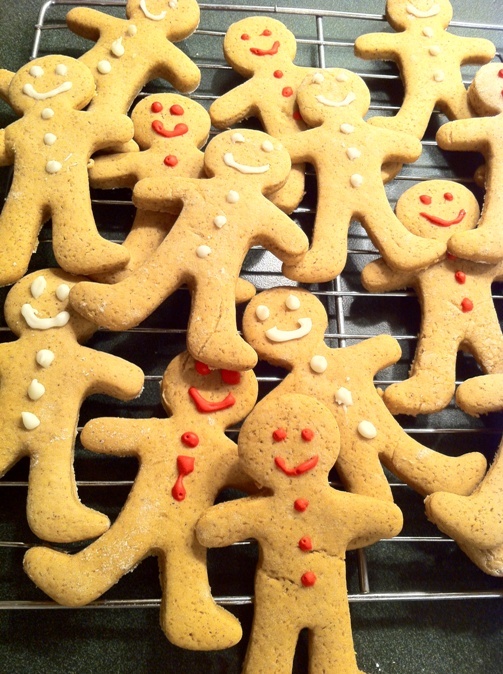 These cookies can make simple ginger bread men or parts of a gingerbread house. What makes gingerbread cookies unique is in how they are decorated. Use this recipe to build memories when baking homemade gingerbread cookies. In a separate bowl, using an electric mixer on medium speed, cream butter and sugar until light and fluffy. Beat in egg until well blended. Stir in molasses and vanilla extract. Add dry ingredients gradually to creamed mixture until blended. Wrap dough in plastic wrap and chill for an hour. Split dough into two balls. Roll one ball to ¼ inch thickness on a lightly floured surface. Use ginger bread man cookie cutter to cut cookies. Place cookies on an ungreased cookie sheet 1 inch apart. Bake for 9-10 minutes or until lightly browned on bottom. Remove cookies from the oven. Cool completely. Store cookies in an airtight container. Place waxed paper in between layers. While you can make your own icing with the recipe outlined here in order to decorate Ginger Bread Cookies, you can also use premade icing purchased at any grocery store.